The WDM converter can be used as a transponder or as a repeater and regenerator. It provides a range of options for repeating optical data signals, converting them to other optical or electrical formats, or combining multiple fibres onto a single fibre. With transparent bi-directional forwarding capability between the 2 fibre media, the WDM transponder brings you the best and simplest solution for Metro, Regional and Long Haul WDM optical networks. 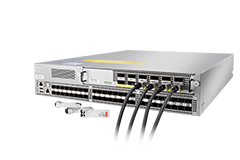 Up to 60km can be accomplished in a point-to-point 40ch DWDM MUX connection by using WDM transponder, which can convert Ethernet signals into a corresponding wavelength in DWDM network. 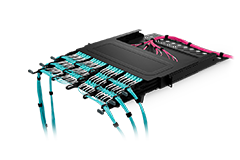 The optical transponder can convert 1G~11.3 Gbps Ethernet signals into a corresponding wavelength in CWDM and DWDM network infrastructures. 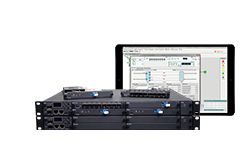 It enables network operators to implement a wide range of media conversions in a compact and flexible design. It can also be used as a repeater to convert the weak optical signals from the fiber into electrical signals and regenerates or amplifies, then recovers them into strong optical signals for continuous transmission. Transponder(OEO) can convert incoming optical signals into precise ITU-standard wavelengths. With MPO/MTP harness cable, one 40G optical signal can be broken out into 4x10G signals, and then the OEO will convert them into the corresponding CWDM/DWDM wavelengths that can be multiplexed. 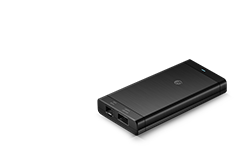 As a part of multi-service transport system, hot-swappable pluggable OEO card only occupies 1 slot in the 1U/2U/4U chassis. 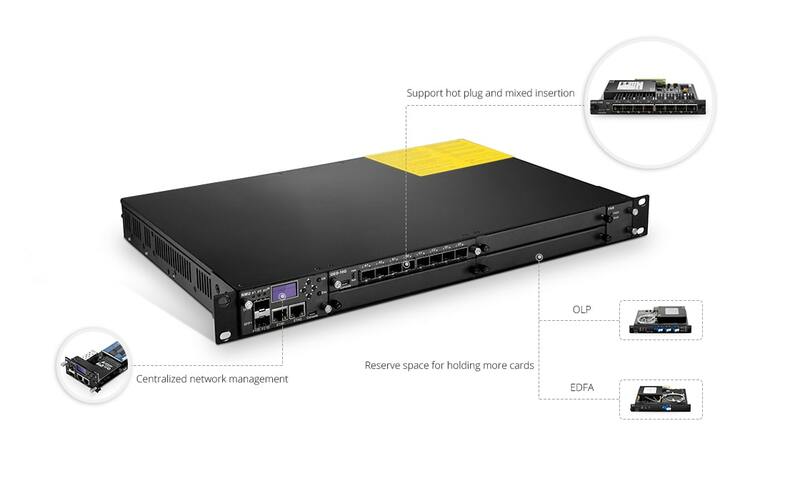 OEO/EDFA/DCM/OLP card can be highly integrated with FS management platform chassis, enabling fast network deployment and taking up minimal rack space. 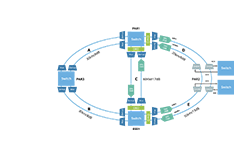 And their scalable design provides a cost-effective upgrade path as network configurations change and grow. 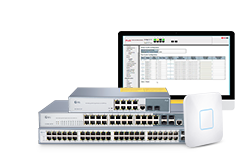 Our Monitor Online based on SNMP is a user-friendly and remote network management system. 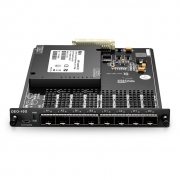 It monitors network performance, and provisioning, provides fault notification status, etc. 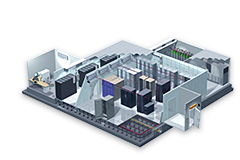 The management system simplifies provisioning of complex networks and services that address today’s and tomorrow’s network management challenges. 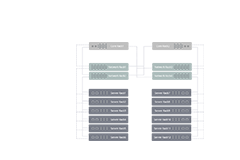 Note: 1U Multiplex Managed Chassis can be equipped with 4 EDFA cards and 4U Multiplex Managed Chassis can be equipped with 16 EDFA cards. I bought the OEO and some other things together. Their products are always with great quality, there is no problem in my operation, and the shipping was also timely. This is my first time dealing with FS.COM. Not only is the product of a very high standard but the customer experience is excellent. I ordered 18 OEO cards for a project and had to split the order because there was insufficient stock in Europe. Our account manager took care of everything ensuring we were kept informed every step of the way. Delivery exceeded expectations. I would have no hesitation recommending FS.COM for your next project. Thank you for the quick shipment of the OEO cards we recently received from FiberStore. The quality once again is superb as usual. The products were well packaged and in very good condition. Thanks to the sale for your excellent assistance with the order, it's always a pleasure to work with you. I'm sure I will be contact soon with another order. Fast service and product worked as advertised. It is nice to have a great source for OEO cards, transceivers and product information. I am very impressed with FS.com. We have used these and more items from FS. Everything we get is great quality and price. Some products that are shipped internationally take a little longer to get but proper planning makes that acceptable. First experience with FS.com and it was great. Easy ordering, fast shipping and terrific customer service. The OEO cards I ordered fit the application I had. I am very pleased with the OEO cards purchased from FS.com. Everything is thoughtfully designed with no details missed. The datasheet is great, it's useful for us to choose the right module. I am truly amazed about the quality of FS.COM WDM converter, the value of the module on the device can be accessed on Monitor Online and SNMP. Engineers from FS help me to design my DWDM network, they are professional and careful. I bought full kits I need, and the project goes smoothly. Really appreciated for the help.